I caught my first glimpse of Allan MacDonald fourteen years ago when I was sanding the floor in preparation for the gallery's Grand Opening. MacDonald's paint-splattered romper-suit appeared through a cloud of sawdust. He was so splashed and wiped with oil paints of many colours; yellows, oranges, reds and blues, that he, like his work, was thick enough with paint to be described as 'impasto.' Ah I thought, at last, a real artist! Is it his first or second skin that is made of paint? His love of creation became as obvious as the paint on his shoes; for he talked excitedly about where he had come from. I think it was an adventure over west where there was a beautiful moon rise. Painting for MacDonald was and still is a devotional act. It is a way for him to express his feelings for the seas, mountains and people that make up his northern world. He tries to capture the instant of magic that catches his eye and pulls deep at the core of his body. It is an instinctive appreciation we all have. Maybe this beauty comes when we catch a glimpse of something bigger and this is what MacDonald is looking for. After he left me and my embryonic gallery I wiped paint from where he stood and from the door handles. Today MacDonald still leaves a trail of paint behind him and he is just as in love with the world. Luckily he still brings back large and small canvassed mementos of his adventures and his skills have been honed further over these fourteen years. 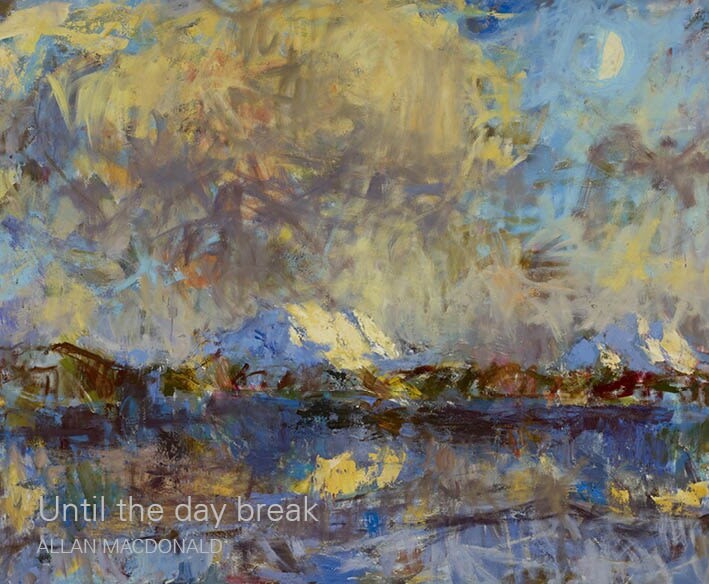 MacDonald's chosen title - 'Until the day break' - comes from the Song of Solomon. The more I look at his recent paintings and piece together this catalogue, the more suitable it seems. In every painting there is a shadow. It's boldly central to some; the cast from his Autumn flowers, from the cliffs at Strathy and even from his van. But this doesn't make them gloomy paintings. There is the feeling that shadow is fleeting, that like light it should be savoured. In MacDonald's skilled hands light and dark create a place to feel alive in, to run in like a 'young hart in the mountains of Bether.' I had to look up Bether. It's a craggy place and this is appropriate too. Yes, MacDonald knows more than ever what he is doing, and for that I really don't mind having to wipe away a few bits of stray paint.